It’s “Talk About Tuesday” around the blogosphere and I’m going to lay off the sewing this week and go tech. You people seem to like it when I show off my hot Geek Gurl status and I had a little set-back with the latest sewing project. Namely you scrawny and curveless people on the net. I hope you get hips the size of New Hampshire when baby-making like me! Seems people want to know how to make their own Chromebook and with a cost of $300-500 USD, I can’t blame you. That’s a nasty hit in the gut for what is little more than a giant web browser. The back story sum up: My friend’s son had a netbook. Sisters, being sisters, dropped it. Out a window. Ouch. Hello dead hard drive. I installed the Chrome OS onto a 4GB SD card and gave it back. The benefits to Chrome OS that I saw primarily lay with the power of “in the cloud computing” and the age of this child. A middle-grade child doesn’t need a whole lot of specialty software. Finding out they could get the hard drive replaced under warranty, the family went that route. The problem? This is a netbook so they had no OS to put back onto it. Brilliant. They couldn’t get a Windows replacement under warranty. I hate Windows so very much. I ended up with the netbook once more. This time with a nice hard drive to load Linux on, with the express request to find something Skype friendly. 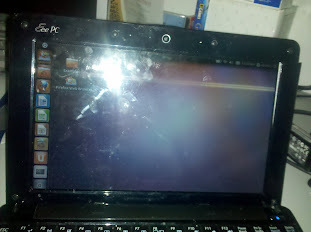 I spent WEEKS trying to get straight up Ubuntu for netbooks to work. Forget it. I installed so many different patches and tinkered with microphone settings until my eyes crossed. I simply could not get it to accept the onboard microphone. I finally went with Linux Mint with Unity. Really, it looks none the worse for wear, all things considered. Yes, that’s the same picture from the previous post. I wasn’t taking another one. After installing Ubuntu Netbook Edition I reveled in the beauty. Thanks! And I’m a bit zany. Glad you enjoyed my sense of humor. It’s always good to know that I come off well!